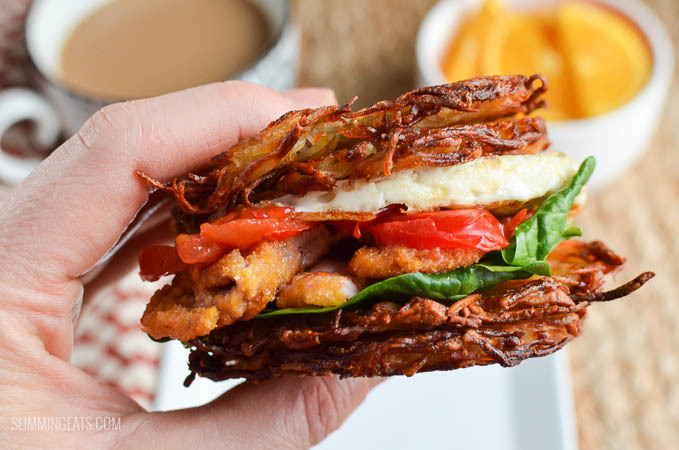 Okay, okay, you can stop drooling all over your keyboard now, want to know how to make this amazing Hash Brown Breakfast Sandwich, you see right before you eyes? 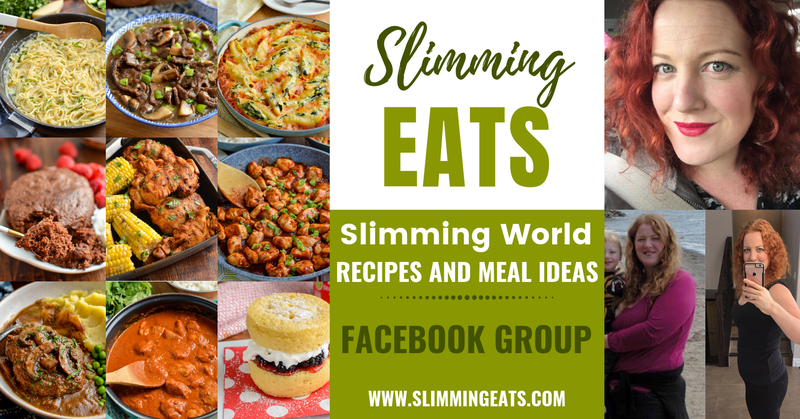 It’s super easy and one you will just carry on making, again and again. 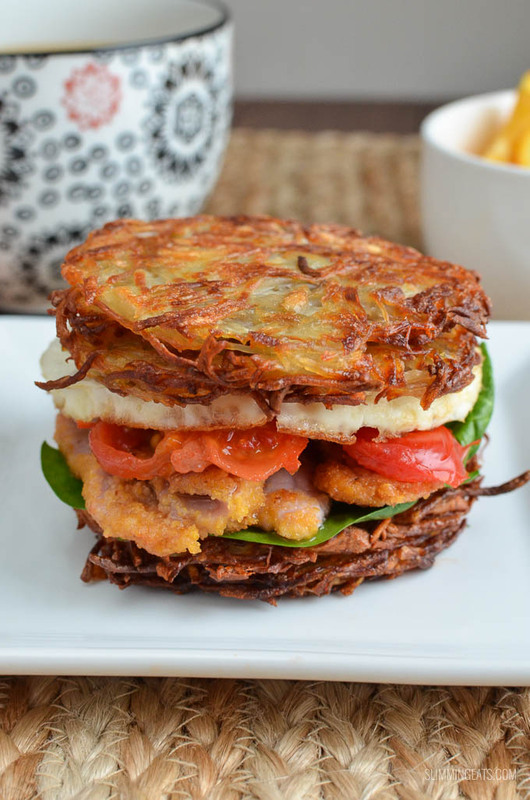 Remember the other week I gave you those Syn Free Crispy Golden Hash Browns? Well I just can’t get enough of them. 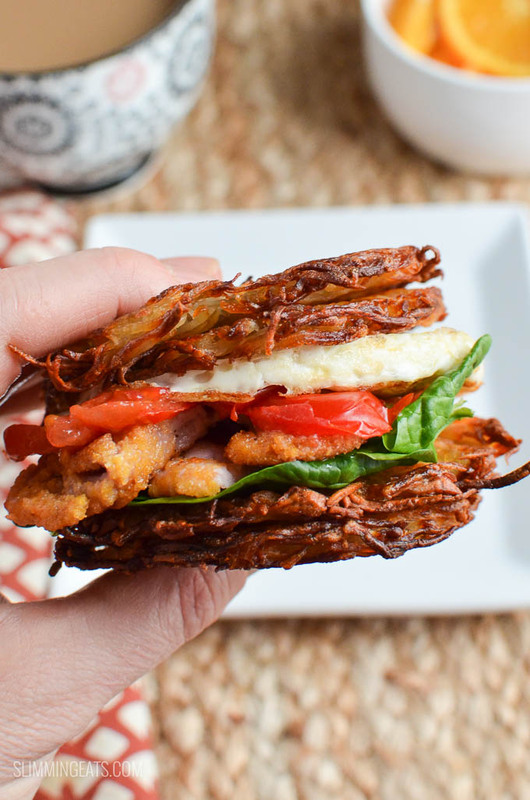 I just want hash brown everything at the moment. I even made this Breakfast Hash Brown Pizza which was just out of this world. You know me, I love my breakfasts and I am not one for sugar ladened cereals, my breakfast is usually always a good source of protein, because it is what keeps me satiated for longer and when I start the day good, the day usually finishes good. There was a batch of my Syn Free Crispy Golden Hash Browns already made up waiting to be used for breakfast this morning (big tip for you here, if you make them up in advance as directed on the recipe and part bake them the night before and then finish off in the morning, they somehow go such more crispier), but not one to like have the exact same plate of food every day, I just had to vary it up. We all love those breakfast sandwiches from fast food restaurants right? 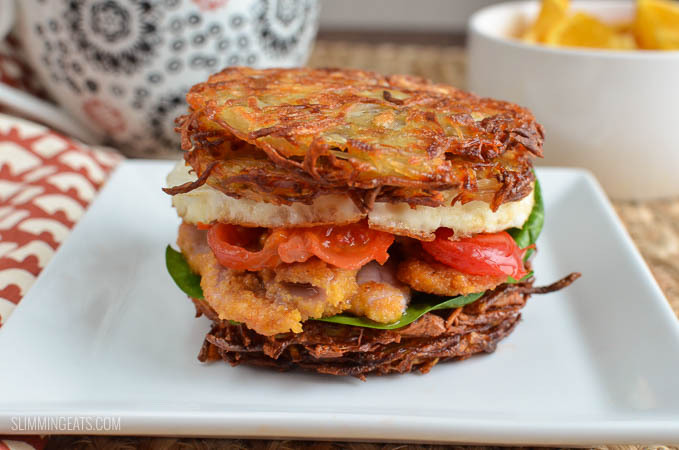 So why not make a Hash Brown Breakfast Sandwich, which is syn free and also doesn’t use any healthy extra’s, meaning you have them free to use elsewhere in your day. Although I am thinking a nice bit of cheddar (I don’t do that yucky plastic slices of cheese) would of been equally delicious in these, if you want to use your Healthy Extra A choice. If you want ketchup, then check out this Low Sugar/Low Syn Ketchup, but I just added some sliced fresh tomatoes (it’s a speed food of course) and some spinach (it gives you muscles apparently, well accordingly to Popeye anyway). 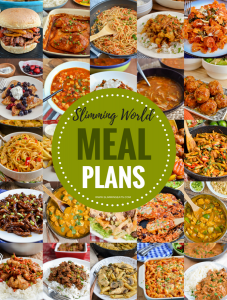 I am not quite sure why I mentioned the speed foods first, maybe just to clarify it does have some speed foods in it, along with the lean Canadian Peameal bacon and egg that is, but just to add a bit more speed, you could serve with some fruit of choice. I could have piled this Hash Brown Breakfast Sandwich with more speed foods, but well it just wouldn’t of been the same, you have to be able to taste the bacon and the egg and the CRISPY GOLDEN HASH BROWNS. 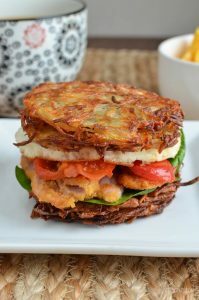 So what you waiting for, knock up a batch of the hash browns (if you haven’t already made some and have a few knocking around in your freezer) and get making this Hash Brown Breakfast Sandwich today, or tomorrow, or the next day. Oh and I forgot to mention it is gluten free, dairy free (so long as you don’t add cheese), could be vegetarian if you skip the bacon and is suitable for those following a Paleo diet. Top with crispy golden hash brown. Variation: Use ham or sausage instead of the bacon (or you could use these Sausage Patties. Got a Healthy Extra A spare? then add some cheese of choice.